The Chairman of the All Progressives Congress (APC) in Lagos ,Alhaji Tunde Balogun on Tuesday night denied any directive from the National Chairman of the party,Chief John Odigie-Oyegun stopping state party chairmen from inaugurating their executive members. 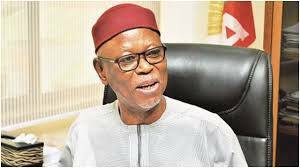 Balogun told newsmen in Ikeja that news reports that Oyegun gave the directive at the inauguration of 33 state party chairmen in Abuja on Monday were misleading. He said Oyegun never questioned his position as the Chairman of the party in the state and that of chairmen of Rivers and Oyo,adding the report was a distortion of fact. “It is not true that Chief Oyegun asked us in Lagos not to swear in our executives .There was nothing like that. “And it was not true that he also directed the chairmen of Oyo and Rivers not to do so.He never said that at the inauguration. “The misleading reports in some newspapers and social media did not just reflect what happened at our inauguration yesterday. “My inauguration confirmed that I have no problem with Oyegun or any other person.We had a congress and I was validly elected. So there is no doubt about my position as the chairman. “In fact, we have since inaugurated our excos in Lagos and work is already in progress.So Oyegun could not have directed us not to swear in our exco,we have already done that, “he said. On the internal wrangling in the party, s chapter, Balogun said disagreement was normal in politics. He said his priority as the new Chairman will be to bring everybody back together so that the party could be stronger in the state. “My priority as the Chairman of the party is to bring everybody together.Yes ,some people organised another congress which we think it is illegal,we are going to reach them. “We will try as much as possible to reconcile all members and bring back those who are not with us”‘he said. The News Agency of Nigeria(NAN) reports there was jubilation at the ACME Road Secretariat of the party over the inauguration of Balogun. Party members danced and sang as they waited all day for the arrival of Balogun from Abuja. The chairman arrived the Secretariat around 7pm.